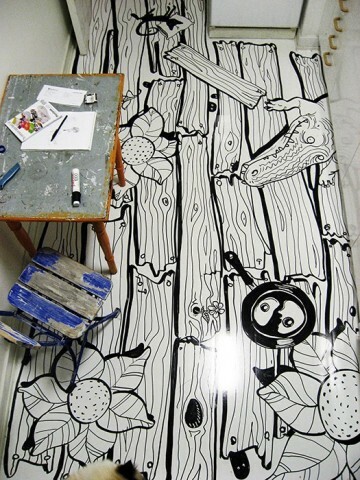 If you're living with a floor you hate, but you don't want the mess of tearing it up, don't have the money to replace it, or you just want a temporary change, then you may like designer Olle Hemmendorff's idea of doodling one. Hemmendorff did not care for his own kitchen floor, but he didn't want to remove it; the floor is wood, and he knew it would be of value when he decided to sell his apartment. So Hemmendorff picked up some self-adhesive plastic shelf liner and "papered" his floor! The liner rolls look to be fairly wide in Hemmendorff's video, maybe 30 or 36 inches, and the covering is white, but so thin that you could see the striations of the wood beneath it. One night, Hemmendorff just starting doodling on the floor with a thick black marker, and low and behold, here's what he doodled! 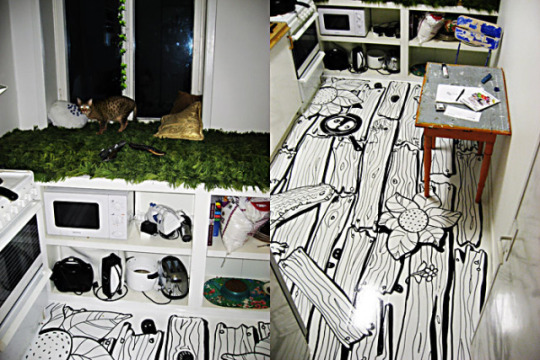 What a clever, inexpensive, and fun way to create a floor. It's a doodle-it-yourself project you don't even have to plan, unless you want to. You can let your kids create their own bedroom floor. Hallways, kitchens, bathrooms, playrooms, and dens.... When the plastic or vinyl shelf liner wears out, just replace it. 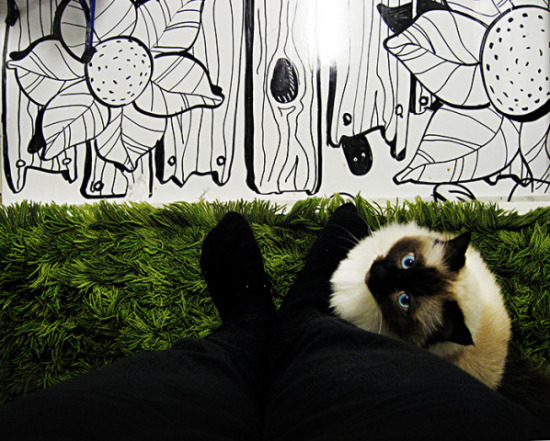 You can re-doodle your floor periodically, whenever you're tired of it. Shelf coverings come in different colors too; so your background doesn't have to be white... and your felt-tips don't have to be black! Check out your hardware store and see what's available or, depending on how much you will need, perhaps you can get a good deal for a volume purchase online.